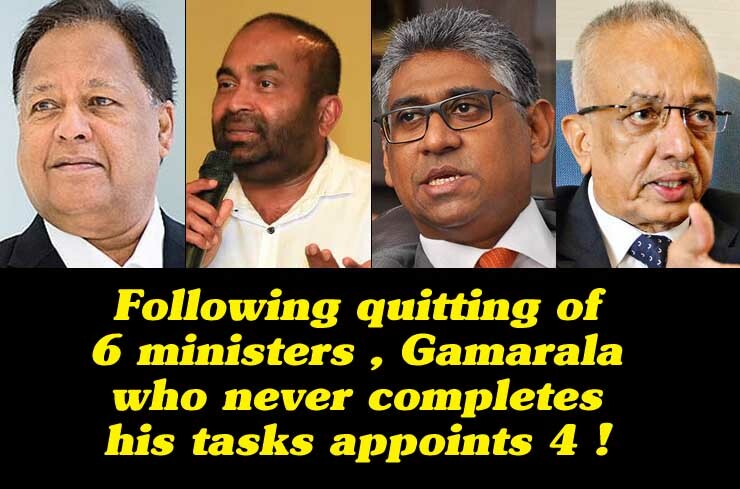 LEN - www.lankaenews.com | Following quitting of 6 ministers , Gamarala who never completes his tasks appoints 4 ! Following quitting of 6 ministers , Gamarala who never completes his tasks appoints 4 ! (Lanka-e-News - 13.April.2018, 10.00PM) Following the quitting of the 6 SLFP cabinet ministers alias serpents, president Gamarala who is always in the despicable habit of completing only half his task appointed only four acting ministers 12th. Sarath Amunugama was appointed as acting minister in place of Susil as minister of science and technology as well as skills development , Ranjith Siyambalapitiya was appointed as acting minister of disaster management in place of Anura Yapa, Faizer Mustafa was appointed as acting minister of sports in place of Dayasiri Jayasekera , and Malik Samarawickrema was appointed as acting minister of social empowerment and labor in place of S.B. Appointment of a UNP minister replacing S.B. is specially noteworthy.